HIVE has taken the space on a 10-year lease in the office building in Whitehall Road by the banks of the River Aire. 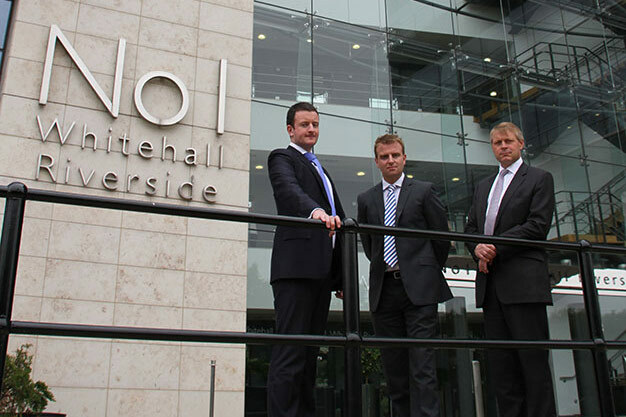 Eamon Fox, partner with global property consultant Knight Frank in Leeds, who are marketing the No 1 Whitehall Riverside, said: “The arrival of HIVE is a resounding endorsement of the quality of No 1 Whitehall Riverside and its occupiers. It should prove to be an excellent facility, serving the thriving West End and South Bank of the city.” Entrepreneurs Andrea Bethell and Roddy Dilasser have joined forces with chef and high street food retailer Ian Kendrew to run HIVE. “There is now only 2,507 sq ft of Grade A office space available to lease on the fourth floor in this iconic 130,000 sq ft building, which can be adapted to the needs of occupiers. “The sheer quality and pulling power of No 1 Whitehall Riverside, with its enviable combination of low running costs, high-calibre occupiers and superb office space, means that there is a good deal of interest in the remaining space. “Recent lettings and lease extensions, including the arrival of HIVE, demonstrate that this splendid building continues to meet the highest expectations of its occupiers. We trust the next few months will provide another exciting chapter in this success story." Tom Foley of landlord NFU Mutual said: “Having worked with the team at HIVE throughout the past few months I am delighted to welcome them to the building to provide an exciting new amenity for our tenants. The service they provide is ground breaking in Leeds and I am looking forward to seeing the growth of their delivery service throughout the local business network. “Securing HIVE so quickly after the previous tenant vacated reinforces No 1 Whitehall Riverside’s position as one of the most prestigious buildings in the Leeds city core,” he said. 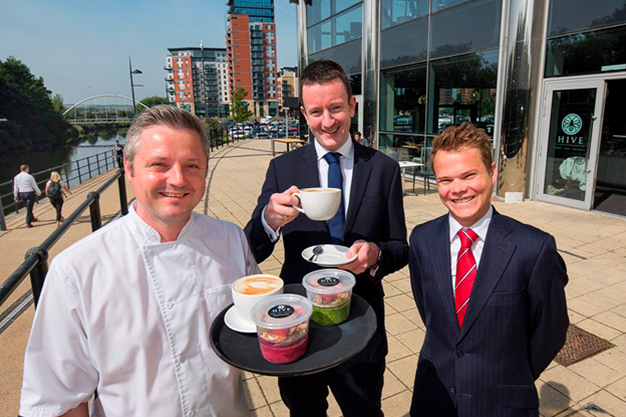 The success story of No 1 Whitehall Riverside in Leeds continues apace, with independent food retailer HIVE opening a café and restaurant on the ground floor. HIVE has taken 1,639 sq ft of retail space on a 10-year lease in the popular office building in Whitehall Road by the banks of the River Aire. Entrepreneurs Andrea Bethell and Roddy Dilasser have joined forces with chef and high street food retailer Ian Kendrew to run HIVE. HIVE was created to provide city centre workers an option for a fast but nutritionally balanced breakfast, lunch and snacks. It is also fully licensed to serve alcohol and has an outside terrace overlooking the River Aire, as well as interior dining space. Mr Fox explained: “No 1 Whitehall Riverside has established an enviable reputation as one of the finest office buildings in Leeds. Occupiers include Aviva, Grant Thornton, Bond Dickinson, Handelsbanken, Michael Page International and IT consultants FDM. Rents in the region of £26 per sq ft reflect the quality of the development. “There is now only 2,507 sq ft of Grade A office space available to lease on the fourth floor in this iconic 130,000 sq ft building, which can be adapted to the needs of occupiers” “The building provides some of the largest floor plates in Leeds which along with the recent £150,000 refurbishment of the office entrance is reaping dividends. This iconic building offers prime Grade A space, and at a time of diminished city centre office stock, has capitalised on occupiers’ flight to quality. Tom Foley of landlords NFU Mutual said: “Having worked with the team at HIVE throughout the past few months I am delighted to welcome them to the building to provide an exciting new amenity for our tenants. The service they provide is ground breaking in Leeds and I am looking forward to seeing the growth of their delivery service throughout the local business network. 2015 was a tremendous year for No 1 Whitehall Riverside, underlining its reputation as arguably the finest office building in Leeds. Two major deals with business services provider FDM and Swedish bank Handelsbanken were completed, with the two companies taking 17,159 sq and 8,160 sq ft respectively. The FDM deal, which saw the expanding IT firm take the whole of the fifth floor at £26 per sq ft on a ten-year lease, was one of the largest office deals in the city last year. The headline rent, also achieved in the Handelsbanken deal added further to the success of No 1 Whitehall Riverside. Eamon Fox, partner with joint marketing agents Knight Frank, commented: “These were two of the most prestigious office deals in Leeds last year. There is now only 9,000 sq ft of Grade A office available to lease in this iconic 130,000 sq ft building, with other quality tenants including Grant Thornton, Arcadis, Straight, BNY Mellon, Michael Page International and Mackenzie Stuart. Richard Thornton, director at JLL commented “The building provides wonderful floor plates immediately available in Leeds which along with the recent £150,000 refurbishment of the office entrance is reaping dividends. This iconic building offers prime Grade A space, and at a time of diminished city centre office stock, has capitalised on occupiers’ flight to quality. “The fact that there is only 9,000 sq ft available to let fully endorses owner NFU Mutual’s investment in the building. This investment included LED lighting, which was pioneering at the time, but look at the result. “Recent lettings and lease extensions in 2015, including the ground floor café The Riverside, demonstrate that this splendid building continues to meet the highest expectations of its occupiers. We trust 2016 will provide another exciting chapter in this success story,” added Mr Fox. The Leeds office of global property consultancy Knight Frank has been shortlisted for a prestigious national property marketing award. Knight Frank’s work on No I Whitehall Riverside in Leeds for NFU Mutual is one of three campaigns which has been named in Regional Offices category in the 2015 Property Marketing awards. Now in their 23rd year, these awards are organised by the Worshipful Company of Chartered Surveyors and Estates Gazette, and highlight the most creative industry campaigns. The winners will be announced at a glittering ceremony on the evening of June 25 at 30 Euston Square, London, hosted by broadcaster and business correspondent Steph McGovern. Eamon Fox, partner and head of office agency at Knight Frank, commented: “This is a great honour for us and we are delighted to be recognised in this way. We were only appointed to market the No 1 Whitehall Riverside office development at the beginning of this year. “Our appointment came hard on the heels of a £150,000 reception refurbishment by owners NFU Mutual, which was followed by high-profile lettings of 8,160 sq ft to Swedish bank Handelsbanken and 17,159 sq ft to the professional services provider FDM at the headline rent of £26 per sq ft.
Mr Fox added: “This was a very prestigious appointment for Knight Frank, marketing what is, arguably, the finest office building in the city. The fact that rents of £26 per sq ft - the highest in the Leeds - have been achieved underlines the sheer quality and pulling power of the building. It has an enviable combination of low running costs, high-calibre occupiers and superb office space. “Recent lettings and lease extensions, including the ground floor café The Riverside, demonstrate that this splendid building continues to meet the highest expectations of its occupiers,” he added. David Hidderley of NFU Mutual commented: “We are delighted that the Whitehall Leeds marketing campaign has been recognised in this prestigious shortlist. It was essential when launching the best floorplates to the Leeds market that the marketing could clearly demonstrate to occupiers the quality of the refurbishment, location and building environment. Achieving 10-year term lettings to FDM and Handlesbanken is a testament the quality of the building and the business strategy put in place.”. Knight Frank’s marketing campaign was supported by Leeds-based design consultancy DS Emotion, PropView TV, niche public relations consultancy Robert Beaumont Associates of Boroughbridge, near York, which specialises in commercial property and joint agent Jones Lang LaSalle. Other occupiers at No 1 Whitehall Riverside include: Grant Thornton, Arcadis, Straight, BNY Mellon, Michael Page International and Mackenzie Stuart. KNIGHT FRANK is talking-up office rents in Leeds, suggesting prices are on the way up to an all-time high of £28 per sq ft.
Occupier demand, allied with the quality of new and refurbished space, is pushing rents up, according to its latest regional office market report. Deals with Handelsbanken and FDM Group saw the companies take space at No 1 Whitehall Riverside at £26 per sq ft.
Eamon Fox, partner and head of office agency with Knight Frank in Leeds, said: “We are seeing the prospect of similar rents be achieved elsewhere in the city of high-quality refurbished accommodation and on new-build product. We are now moving in the direction of £28 per sq ft.
“Meanwhile the good news for Leeds continues. Investor appetite for regional office stock is strengthening. Not surprisingly, given the substantial weight of money targeting regional offices, the office yield, which is the annual return on an investment expressed as a percentage of the capital value, is a healthy 5.25%. Nationally, given current named requirements of 4.58m sq ft, which is the highest in five years, we expect to see higher levels of occupational demand back above the five year average. 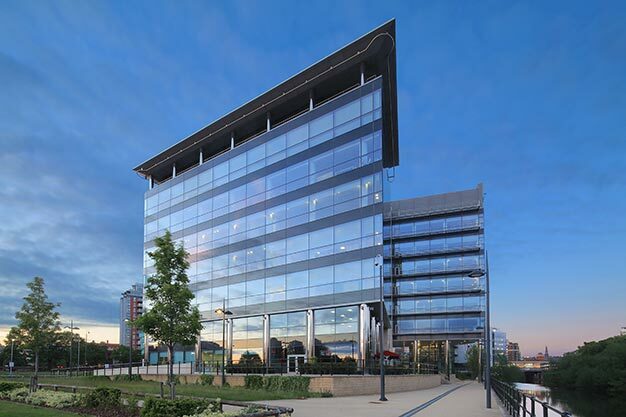 FDM Group has taken a 10-year lease at No 1 Whitehall Riverside in what has been described as the largest office letting in Leeds so far this year. The company will move in June to the fifth floor, of 17,159 sq ft, at a rent of £26 per sq ft.
FDM is a professional services provider that focuses on IT and plans to recruit 1,000 graduates this year across its four UK offices, of which 350 will be in Leeds. Its local customers include Yorkshire Building Society, Asda, and The Co-operative Group. The company added: "Moving to a bigger space means we will able to take on even more high-calibre graduates and ex-forces personnel and train them to become successful IT and business professionals. 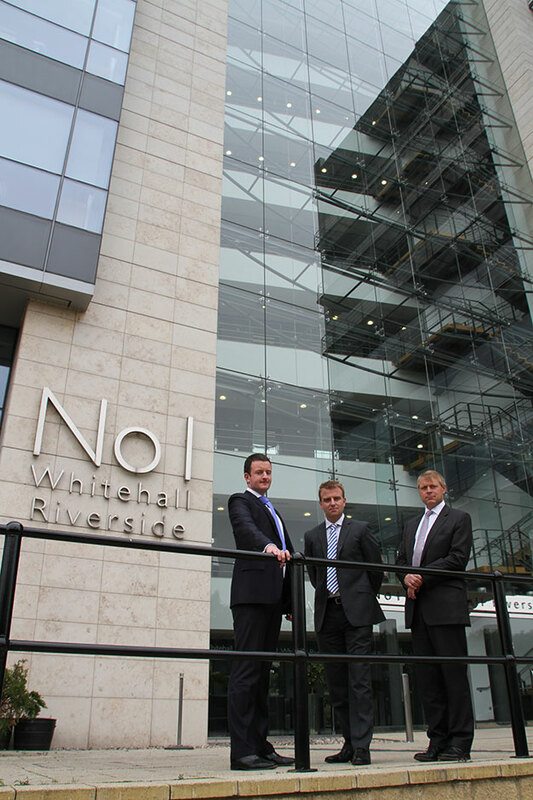 Landlord NFU Mutual invested £150,000 in No 1 Whitehall Riverside, which has prompted this second letting in three months. FDM follows Handelsbanken, which has just moved in to its 8,300 sq ft office, and they will also join Grant Thorntonand BNY Mellon among the occupiers in the building. IT and business services provider, FDM Group ("FDM"), has agreed to take 17,159 sq ft of space at No1 Whitehall Riverside in the largest office letting to conclude in Leeds so far this year. David Hidderley of landlord NFU Mutual welcomes FDM to Whitehall Riverside on the back of the letting to Handelsbanken and who took occupation this month. FDM has signed a ten year lease on the entire fifth floor at a rental of £26.00 per sq ft.
Sheila Flavell, COO at FDM commented: "No 1 Whitehall Riverside is ideal for our needs; it is a high profile building with a lot of space,enabling FDM to expand the business in Leeds in order to continue servicing our very established and growing client base in the area." Richard Thornton, from the Leeds Office Agency team at JLL who advised the landlord, said: "No1 Whitehall Riverside provides the largest floor plates immediately available in Leeds which along with the recent £150K refurbishment of the office entrance is reaping dividends. This iconic building offers prime Grade A space, and at a time of diminished city centre office stock, has capitalised on occupier’s ‘flight to quality’." The Leeds office of global property consultancy Knight Frank has been appointed to market the flagship 130,000 sq ft No 1 Whitehall Riverside office development in Leeds. The news of Knight Frank’s appointment at No 1 Whitehall Riverside comes hard on the heels of a £150,000 reception refurbishment by owners NFU Mutual and the letting of 8,160 sq ft to Swedish bank Handelsbanken at a headline rent of £26 per sq ft.
Eamon Fox, partner with Knight Frank in Leeds, specialising in office agency, commented: “This is a very prestigious appointment for Knight Frank, marketing what is, arguably, the finest office building in the city. The fact that a rent of £26 per sq ft - the highest in the Leeds - has just been achieved underlines the sheer quality and pulling power of the building. “The recent letting to Handelsbanken means there is just 26,000 sq ft of high quality office space left to lease. We are currently finalising legal terms for the whole of the fifth floor, comprising 17,159 sq ft, and will be announcing the new occupiers shortly. This will be the largest Grade A office letting in Leeds this year. “On a personal note, I have had a long association with the building, having marketed it at my previous firm DTZ. It has an enviable combination of low running costs, high-calibre occupiers and superb office space. David Hidderley of NFU Mutual commented: “We are delighted to welcome Eamon Fox and Knight Frank on board as joint marketing agents with JLL. Their knowledge of the office market in the city is extensive, while their experience and expertise will prove invaluable in attracting quality new occupiers to No 1 Whitehall Riverside”. Other occupiers include: Grant Thornton, Arcadis, Straight, BNY Mellon, Michael Page International and Mackenzie Stuart. Following the Grade A refurbishment of 2 floors in No 1 Whitehall Riverside, by landlord NFU Mutual, we are pleased to announce the letting of 8,300 ft² to Handelsbanken for a new regional head office serving Yorkshire and the North East, on a new 10 year lease at the rental of £26.00 per ft². Richard Thornton of letting agents JLL said, “No 1 Whitehall Riverside is already home to a number of corporates and Handelsbanken are just another high calibre occupier to be added to an already impressive tenant line up and who also benefit from some fantastic amenities on the ground floor with the very recently upgraded and remodelled Riverside Café”. JLL and Knight Frank are letting agents for No 1 Whitehall Riverside. NFU Mutual, the landlord’s at No 1 Whitehall Riverside have achieved some very early success on the back of their continued investment in this prime Leeds asset. Following the Grade A refurbishment of 34,000 ft², arranged over two floors, the landlord has undertaken a contemporary refurbishment of the reception area, having spent in excess of £150,000. This has not only received some excellent feedback from the tenants already in the building, but some 8,000 ft² is already under offer, with an announcement of the letting expected shortly to a major corporate. Eamon Fox partner at Knight Frank commented, “This continued investment in the building ensures No 1 Whitehall Riverside leads the way within the hierarchy of business accommodation in Leeds. It is no surprise we are ahead of our business plan in respect of letting accommodation within the building”. Leeds, 5 August 2014 - 80 per cent of offices take-up in the first half of 2014 in Leeds has been for Grade A/B space with occupiers becoming increasingly discerning over the quality and energy efficiency of the space they occupy yet equally seeking value for money according to property agents JLL and DTZ. At the same time, both landlords and tenants are keen to ensure compliance with key pieces of energy legislation including the UK Energy Act 2011, which comes in to force in April 2018, which makes it unlawful for landlords to lease space, and for occupiers to assign leases or sublet, in buildings with an energy performance certificate (EPC) rating of F or G.
One such building in Leeds which has successfully responded is NFU’s No1 Whitehall Riverside, which has been future proofed withenergy saving measures including the installation of low maintenance LED lights – the very first building in the city to install them. These lights, which have a life expectancy of 2.5 time’s traditional fluorescent lamps, allow fittings to be ‘dimmable’ to greatly reduce energy consumption. Eamon Fox, director of office agency in DTZ’s Leeds office, added: “It was an easy decision to install the LED lighting scheme at No1 Whitehall Riverside everything under them looks more vibrant. We all know LEDs are environmentally friendly, containing no mercury or lead, reducing our carbon footprint and occupiers really buy into this. “The LED system at No 1 Whitehall Riverside will also keep the Finance Director happy, as they last significantly longer than traditional incandescent light fixtures and very simply they are the most cost-effective lighting source you'll find, they improve energy performance which in turn saves occupiers’ money, which is the ultimate bottom line”. A state of the art building, such as NFU’s No1 Whitehall Riverside in Leeds, has been future proofed with low energy saving measures including LED lights. The lights switch on instantly, generate very little heat and use less energy than traditional bulbs. Pixi FlatLight™ LEDs are ideal for hard-surface mounting on walls, ceilings and under countertops. They can also be suspended using easy-to-install mounts. An EPC presents the energy efficiency of a property on a scale of A to G. The most efficient properties are in Band A.
Leeds, 15 January 2014 - NFU Mutual has unveiled the largest single office floor plate currently available in Leeds city centre following the completion of a £1million refurbishment programme at one of the city’s landmark office schemes. The insurance firm, who owns No 1 Whitehall Riverside, has refurbished 34,000 sq ft of space within the building to transform the 4th and 5th floors creating new flexible and sustainable space. In a first for the Leeds office market, 100% LED lighting has been installed on both floors providing low maintenance and high quality lighting which will reduce CO2 emissions for future occupiers. David Hidderley, Investment Fund Surveyor at NFU Mutual, said: “With a limited amount of Grade A office accommodation remaining in Leeds city centre, and no speculative office development on the horizon, the refurbishment of space in prime locations with good sized and well configured floor plates has become more important than ever. Joint letting agents Jones Lang LaSalle and DTZ believe that No 1 Whitehall Riverside is well positioned to respond to current market conditions. No 1 Whitehall Riverside, which provides 127,731 sq ft of office accommodation over eight floors, was acquired by NFU Mutual in 2010. It is already home to Grant Thornton, Straight PLC, Bond Dickinson LLP, BNY Mellon, Michael Page International, Arcadis and Mackenzie Stuart. Joint letting agents DTZ and Jones Lang LaSalle are quoting £26.00 per sq ft.
A one million pound refurbishment programme has started on No 1 Whitehall Riverside one of Leeds’ landmark offices which has the largest floorplates and amount of vacant grade A space currently available in any one building in the city centre. The Leeds offices of property firms DTZ and Jones Lang LaSalle have been instructed to market both floors at this iconic riverside office building which is coming on to the market at a time when the availability of top quality offices in Leeds is the lowest for a number of years. Landlord NFU Mutual, who have appointed contractors Morris and Spottiswood is undertaking a modernisation and refurbishment programme which will ensure that the building’s two 17,159 sq ft vacant office floors will benefit from a comprehensive refurbishment to bring the premises back to a striking Grade A standard. Works are scheduled to complete in December 2013. David Hidderley, Investment Fund Surveyor at NFU Mutual, said; “The arrival of 34,000 sq ft of newly refurbished space in the building comes at a time when there is a shortage of Grade A space currently available in the heart of Leeds city centre. No 1 Whitehall Riverside has the largest floor plates and quantity of available Grade A offices space currently to be found in a single building within Leeds city centre and we already have a good level of occupier interest. 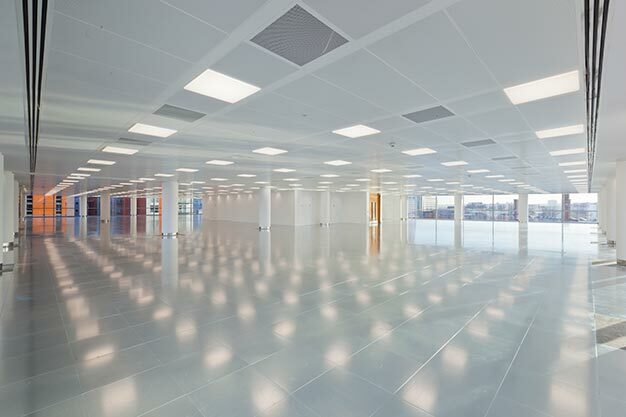 Setting a precedent for Leeds city centre offices, 100% LED lighting will also be installed on the two floors which will mean new occupiers will be able to enjoy the benefits of excellent light quality, low maintenance and cost savings on occupation whilst reducing CO2 emissions. No 1 Whitehall Riverside, which provides 127,731 sq ft of office accommodation over eight floors, was acquired by NFU Mutual in 2010. It is already home to Grant Thornton, Straight PLC, Bond Dickinson LLP, Bank of New York Mellon, Michael Page International, Arcadis and MacKenzie Stuart. Joint letting agents DTZ and Jones Lang LaSalle are quoting £26.00 per sq ft.